Whether caused by age, arthritis, injury, weight, or illness, chronic back pain can become frustrating. The thoughts of surgical procedures to correct the constant pain might terrify you more than dealing with the constant pain. Before doing something as invasive as back surgery, consider trying some of these nonsurgical treatments first. You may discover you can control or completely eliminate your discomfort without undergoing surgery. Physical therapy. John Hopkins Medicine states that this should be one of the first nonsurgical remedies you should try in order to reduce, control, or eliminate chronic back pain. Physical therapists are trained to evaluate patients, zeroing in on possible causes of the pain. They then develop individualized treatment plans for each patient. Physical therapy may correct an individual’s posture, increase the patient’s flexibility, and strengthen the individual’s core all at the same time. Exercise. Although this seems counterintuitive, the Advanced Intervention Pain Clinic (AIPC) states that inactivity actually makes chronic back pain worse. Exercise increases blood flow to the areas that are causing pain, encouraging healing. Continuing to move keeps the body from stiffening and helps with managing weight. One of the best forms of exercise for individuals who suffer from chronic back pain is walking. Diet. Not to be confused with trying to lose weight, a change in diet for chronic back pain sufferers focuses on eliminating foods that are known to cause inflammations. John Hopkins Medicine recommends avoiding foods that are high in trans-fats, contain refined sugars, and are highly processed. Lifestyle modifications. When your body speaks, listen. If some motion or activity is creating pain, either alter the motion or activity to eliminate the pain, or maybe discontinue the activity altogether. 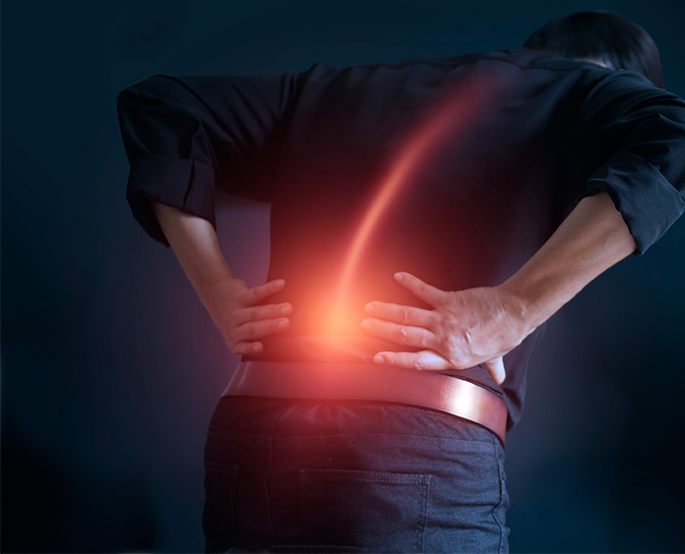 Knowing when to stop things that are causing pain may help slow down the progression of deteriorating discs or other issues that are at the root cause of your chronic back pain. Alternative therapies. Each individual is unique, and so is the body and how it responds to treatments. Alternative therapies such as acupuncture, massage, chiropractic adjustments, bio-feedback, laser, and electrical nerve stimulation may be exactly what you need. Being open to try alternative therapies is key to avoiding surgical solutions. Medication. Medication like anti-inflammatories, muscle relaxants, and analgesics can be used to get chronic pain and inflammation under control. Medication doesn’t provide a long-term answer, though. Taking these medications for long periods of time comes with its own set of drawbacks like unwanted side effects and opioid addiction. Spinal cord stimulation. Still considered a non-surgical treatment, AIPC uses spinal cord stimulation to block the pain signal being sent from the back to the brain. Thin wires with electrical leads are placed near the spinal column and an electrical current is sent through two small incisions. This current blocks the pain signal to the brain. Injections. Spinal injections have several different uses. If the source of the pain is definitively known, doctors may use a nerve block, epidural steroid injection, or nerve ablation to target the specific area, giving you temporary, but immediate, relief. If doctors are uncertain as to where exactly the pain is originating from, spinal injections can be used to help locate the actual source of the pain. Because the relief from spinal injections is temporary, injections are generally coupled with something like physical therapy to get you more permanent relief from your chronic back pain. Just because you suffer from constant pain doesn’t mean you have to resign yourself to either going through surgery or just suffering the rest of your life. With so many nonsurgical options, speak with a specialist at Atlanta Brain and Spine Care today to see which options are best for you.